Bothwell Cheese is proud to offer Canadian consumers three varieties of Non-GMO Project Verified Cheddars: a Medium and Old Cheddar, and our NEW 548 White Cheddar that has been aged for a minimum of 548 days (1.5 years). This line of cheese was created because of consumer demand, those prefer products made without GMOs. The development of this line of cheese took nearly three years and a huge commitment from everyone involved. To make a Non-GMO Project Verified cheese, the milk must come from cows that are fed Non-GMO verified feed. 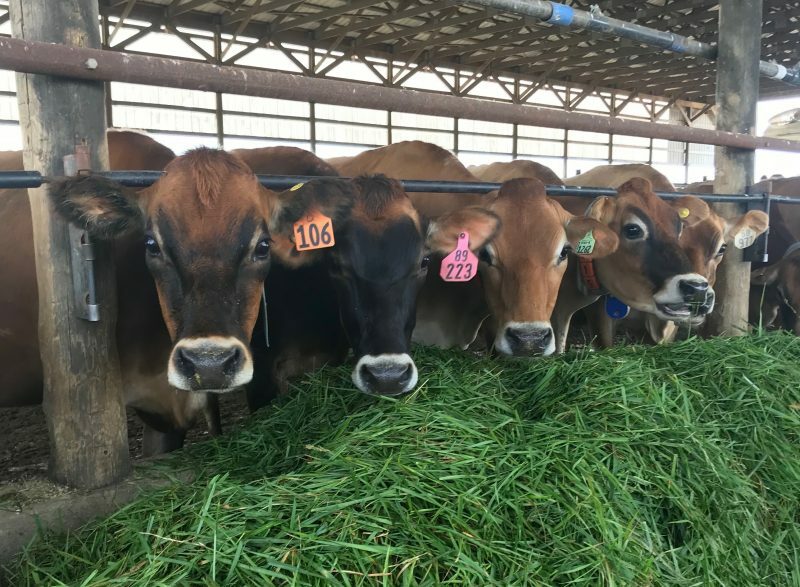 Two local dairy farms, Nyhof Farms and Braunsdale Holsteins, started this journey alongside Bothwell Cheese by converting their farms to grow only non-GMO verified crops. The crops that are grown on these farms are tested during harvest and the feed that is purchased for the animals is tested upon delivery. 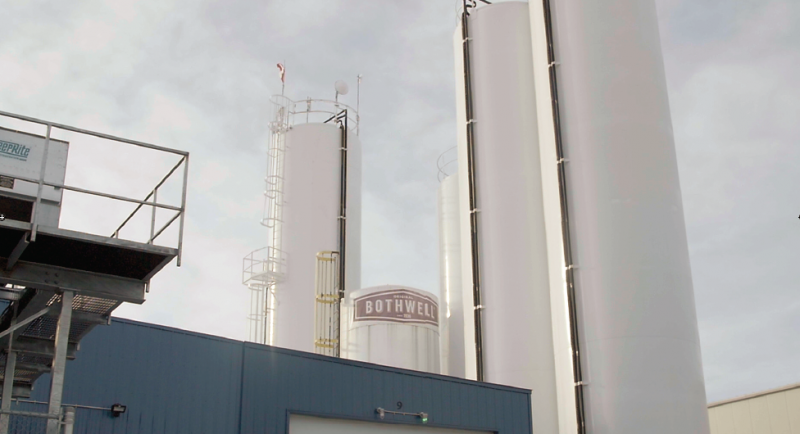 In addition, Bothwell Cheese installed two new silos to segregate the milk we receive from these farms. 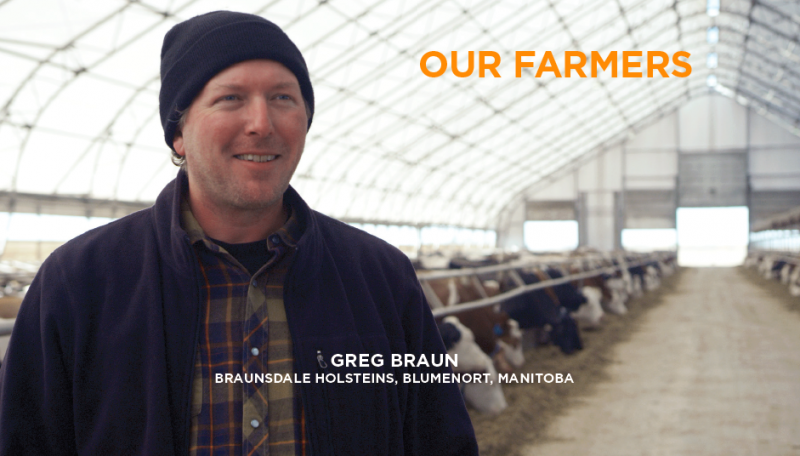 Braunsdale Holsteins is located near Blumenort, Manitoba, just six miles from the Bothwell Cheese plant. About three years ago they started growing non-GMO verified crops, and for the last two years their whole farm has been non-GMO verified. “It’s a natural fit for us to partner with Bothwell Cheese and provide the milk for their Non-GMO Project Verified cheese.” says Braun. “We’re proud of the quality of our milk and we’re proud that it’s going into a premium, quality cheese”. Nyhof Farms is located near Île des Chênes MB, approximately 10 miles from the Bothwell Cheese plant. 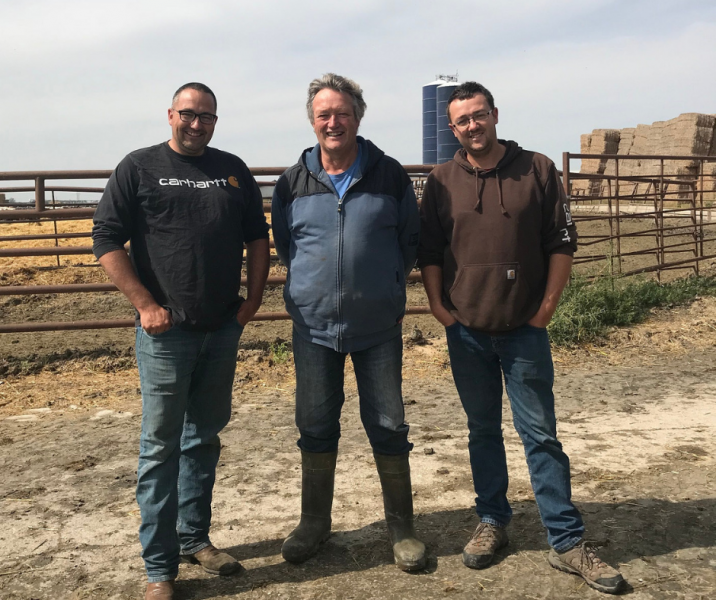 They are seventh-generation dairy farmers who immigrated to Canada from Holland in 1993. Together with their father Albert, sons John and Henry grow grass, corn, and alfalfa, all of which are non-GMO verified. The Nyhofs partnered with Bothwell Cheese because they believe consumers should have a choice in the food that they consume. 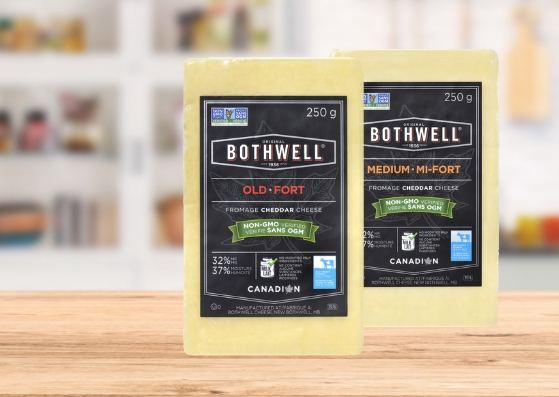 They are equally enthusiastic about the fact that they are one of two farms who exclusively supply milk to make Bothwell’s Non-GMO Project Verified cheese. “It’s exciting for us to see this cheese being sold across Canada and to realize that this milk is coming from our farm,” says Henry Nyhof. 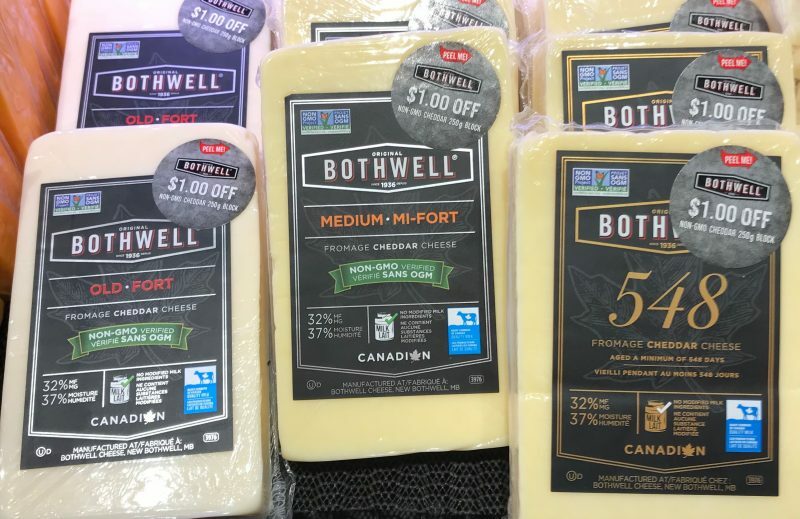 All three of Bothwell’s Non-GMO Project Verified cheeses are now available at Sobeys stores across Canada with a $1 off instant savings coupon. Click here to find a Sobeys store near you. Click here for a list of other retailers across Canada who carry our Non-GMO Project Verified White Cheddar Cheeses. Comment below to enter by Wednesday, October 31st. *One entry per person. Winner will be contacted by email and will have 24 hours to respond. No cash value. Contest open to Canadian residents only. Alphafa is one of the Non-GMO crops that is grown on the Nyhof family dairy farm. corn is one of the Non-GMO crops grown on the Nyhof family farms. Corn is grown on their farm. The Nyhof family grows alphalfa. Alfalfa is one of the Non-GMO crops grown on the anyhow farm. Bothwell is my favorite kind of cheese! The Nyhof family dairy farm grows corn, as well as alfalfa and grass. Yay for non-GMO cheese! Love Bothwell cheese and happy to support local. I am impressed with the new store on Provencher Blvd. in St. Boniface. Cheese all the way lol..
Corn is one of the non-GMO certified crops. One of the Non-GMO crops that is grown on the Nyhof Family dairy farm is grass. Corn is one of the non -GMO crops that the Nyhof family dairy farm grows. Please enter me to win the cheese. Thank you. grass, corn, and alphafa, all of which are Non-GMO verified. A non-Gmo crop that the Nyhof family dairy farm grown is corn. Please enter me to win the cheese. Thank you. These would be awesome to try! Corn is one of the Non-GMO verifies crops they grow. The crop is corn! Thank you for the opportunity and love your cheese! Corn is grown on the Nyhof dairy farm. I love Bothwell cheese and it’s very fortunate that Manitoba has 2 dairy farms supplying Bothwell with non-GMO milk. One of the Non-GMO crops the Nyhof family grows is corn. They grow Non-GMO verified corn! One of the Non GMO ingredients grown is corn. Bothwell “OLD”- would love to try all 3. Corn is one of the Non-GMO crops grown on the Nyhof family dairy farm. grass is one of the Non-GMO crops that is grown on the Nyhof family dairy farm. Corn! Thank you being so very generous. Grass, corn and alphafa are the noon GMO crops. Corn is one non-GMO crop they grow. One of the crops the Nyhof family grows is corn. Awesome cheese Bothwell Cheese company!!! Kudos to the Nyhofs for helping make such fabulous GMO Free! Bothwell cheese. Am sure that in addition to the corn and alfalfa that they grow, they treat their contented milk-producing cows well, and that is reflected in the superior taste of Bothwell. My motto is: Life Without Cheese, Is Not Worth Living! Keep The Flag Flying Gentlemen. One of the crops the Nyhof family grows is corn!! I love New Bothwell Cheese! I loved reading that the grass, corn and alfalfa that in turn becomes part of the fantastic cheese I love is organic. I now have an escuse to eat more delicious Bothwell cheese! The Nyhof family grows Non-GMO corn. thank you. One of the crops that is grown on the Nyhof family dairy farm is corn. Corn is one of the non GMO crops they grow on the Nyhof farm! Corn is one of the non GMO crops grown. Corn. Thanks very much for the opportunity to enter the contest. They grow the following Non-GMO crops: grass, corn, and alphafa. Your cheesed are fantastic! One of my favorites is your truffle cheese – can’t get enough! Keep up the amazing work. Answer to the contest question: grass, corn, and alphafa. Contest answer: Grass is one of the non-GMO verified crops that is grown on the Nyhof Farm. Do I get bonus points for noting that the word alfalfa, another crop they grow, is misspelled in the article? Should read ‘alfalfa’ not ‘alphafa’ as written. Like our kids said while I was taking pictures of them when they were very young, “Smile, Cheese”. Corn is a crop that they grow that is non GMO modified. Corn is a Non-GMO crop grown by the Nyhof family. One of the Non-GMO crops that is grown on the Nyhof family dairy farm is corn. The Nyhofs grow non-GMO corn. Alphalfa is one of the crops grown by the Nyhof family. I would love to win non-gmo cheese!! Corn is one of the non -GMO crops grown on the Nyhof family dairy farm. Corn! Thanks for the chance! Alfalfa is one of the non-GMO crops grown on the farm. One of the non-GMO crops grown on the Nyhof’s dairy farm is alfalfa. The answer is grass, corn and alfalfa. NonGMO Corn is grown on the farm! Good work guys! Nyhof farms grow grass, corn and alphafa. Bothwell cheese is by far the absolute best cheese! I commend you on elevating your product beyond all others! You should be very proud of your products because I certainly am! Thanks to Sobeys for partnering with you to make your products more available to all! Excellent business decision on their part!!! The Nyhof family grow non gmo alpha as well as grass and corn. Grass is one of the crops grown on the Nyhof dairy farm. Corn! Way to go guys, we need more of this in all our grains and produce!!! Alfalfa is one of the non-GMO crops grown by Nyhof Farms. Corn! Good to know 🙂 thanks! Corn is one of the non-GMO crops. They grow grass, corn and alfalfa, Why name just one! Love you guys, I hope to seize your cheese!! Corn is one of them! Alfalfa, corn & grass make up the non-GMO crops. Love Manitoba made Bothwell Cheese. So happy to hear about the NON-GMO cheese made from milk provided from cows fed NON-GMO Grass, Alfalfa and corn on Nyhof Farms and Braunsdale Holsteins, two Manitoba Farms. Thank you so much for going NON-GMO! Alfafa is one of their non GMO crops. Love your cheese! Grass is one non-gmo crop. Grass is one of the non-gmo crops. BTW, the non-gmo cheese is very good. I’ve tried one of the non-GMO varieties and it’s fantastic! Can’t wait to try the rest! One of the GMO crops grown on the Nyhof Farm is corn. This sounds like a lovely yummy gift. The Nyhof Farms grows the non-gmo crops of alfalfa, corn and grass. Alfalfa. Love this, considering that new trade agreements will allow milk with GMO by products from the US into Canada. They grow non-GMO grass, corn & alfalfa. We’re curious to try out this new cheese. Thanks for this chance to win Bothwell & good luck everyone! Corn is one of the non GMO plants they grow! One of the Non-GMO crops that is grown on the Nyhof family dairy farm is Alfalfa! Grass. Very interesting write up. Great to know about these farms!! Grass is one of the Non-GMO crops that is grown on the Nyhof family dairy farm! Corn is one of the Non-GMO crops that is grown on the Nyhof family dairy farm, along with grass and alfafa. Corn is grown at the GMO farm. Eat a lot more cheese since shopping at New Bothwell. Alfalfa is one of the crops that they produce. Corn is one of the non-GMO crops that is grown on the Nyhof family dairy farm. Alfalfa! I love that you make non GMO cheese! Alfalfa is one of the crops grown. PS. I love Bothwell Cheese, especially Squeakers! Corn is one of the crops grown. Corn is one of the crops. Alfalfa is one of the Non-GMO crops grown on the Nyhof farm. Alfalfa and corn are two. Alfalfa is one of the Non-GMO crops that is grown on the Nyhof family dairy farm. Alfalfa as well as corn. Alfalfa is one of the non-GMO crops grown.